Please note: This article is still relevant but there is a newer version on the topic of unlocking an iPhone passcode you should also check out. Forgetting your password or passcode for your iPhone is a nightmare. It is possible to gain access to your iPhone and not lose any data if you follow the instructions below carefully. It can be done. This article will explain what you need to do in simple, easy to follow steps. If you follow along carefully you should be able to reset the passcode and gain access to your iPhone again. Hopefully making your nightmare a thing of the past! If you are interested in an iPhone 6 factory unlock, or iCloud lock removal then you are reading the wrong article. These are very different kinds of lock from the passcode and require a different method to fix it. Which model of iPhone does this apply to? What is the unlock process? These instructions are likely to work for iPhone 3 / 3GS / 4 / 4S / 5. However, the software, called iOS, is the important thing not the model of iPhone you have. iOS 7 was released in 2013 especially for the iPhone 5S and 5C so any iPhone released before that is likely to have iOS 6. One thing to remember is that iOS 7 was compatible with the iPhone 4, 4S and 5 so if you have those models you may be running iOS 7 or newer if they were upgraded to the latest version of the software. Don’t know what version of iOS your iPhone has? Newer iPhones came with iOS 7 pre-installed so you will need to read the instructions on how to unlock iOS 7 passcode instead. The type of unlock you need for your iPhone. The version of the software (called iOS) that your iPhone has. If the iPhone has been synced to iTunes before. Finally, if you have a computer to hook your iPhone up to. Once you have selected the answer to all the above questions you will be given a simple set of step-by-step instruction of what to do. After too many attempts, your iPhone will say “iPhone is disabled, connect to iTunes”. You can unlock an iPhone if you forgot your passcode. You do this by restoring your iPhone from the last backup – this removes the passcode from your locked iPhone while retaining your data. This may take a few hours to complete. 1. Synchronise your iPhone to your computer – you can do this even if your iPhone is locked. This creates a backup of everything on your phone. Obviously, this works best if you have access to the computer your regularly sync your iPhone with. 2. While your iPhone is still connected to your computer reboot your iPhone by holding down the power and home buttons at the same time. As soon as the Apple logo appears, let go of the power button but keep the home button depressed until you see a “Connect to iTunes” message appear on the iPhone screen. 3. 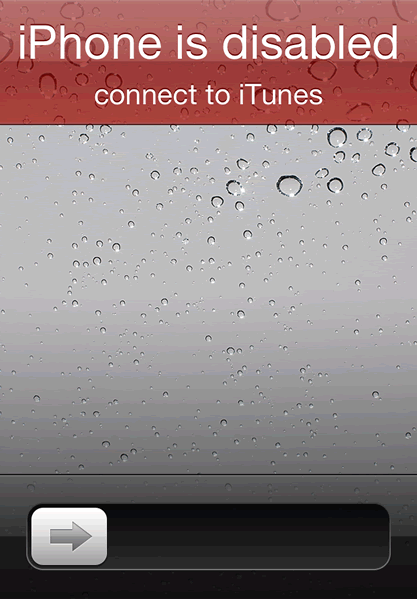 On your computer, you will see a message appear in iTunes that a phone in recovery mode has been detected. You will be prompted to choose whether you want to restore your iPhone to factory settings, or restore it from a backup – if you want to put all of your personal information, contacts, messages, etc. back on to your phone, be sure to choose to restore it from the backup you performed in step 1. 4. Your passcode will be erased and then all of your data will be restored from your backup. Once this process completes, the passcode will have been removed from your iPhone, and you should now be able to access it without any problems. I love getting feedback from visitors. It encourages me to find further solutions to those awkward little iPhone, iPad, MacBook, and Mac problems that we all suffer from. Hi James. My daughter passed away recently and we want to unlock her phone, but we don’t know the OS version. No way to sync to iTunes account. She died on 10/13/17. I believe if there’s any software update, she most likely have updated her phone. We really want to unlock her phone without losing any data. Can you please help? I was given an iPhone 4. Former owner cannot remember code. I was told to download itunes app and break code through itunes. I am working w a Samsung tablet….can you help? My son has passed away and I need to access his iPhone 6S. It has a 6 digit pin which I don’t know. I don’t know if the phone was ever synched to iTunes. I am anxious not to lose any data, photos, videos, texts etc. Please could you advise me of the best way to proceed as I’m nervous about any loss as I will never be able to retrieve it. Many thanks for any help you can give me. Hi LCL, i have the same sentiments as you. Daughter died just recently. If you ever figure it out, please let me know through this discussion. Thank you. hello sir I switched off my iPhone 6s plus and after switching it on its asking the passcode and I forgot it the sim which is linked to the apple id is lost so whenever am trying to change the settings of the mobile from icloud from laptop its asking me too verify the verification code sent to dat num so how should I unlock my mobile now? Hello! I seem to have forgotten my password to “sync” and back up with me macbook. iphone 5. Expert opinion pls? can’t you just press the restore button, what’s the difference? my problem is that I don t have backup on my computer ??? Thanks for this tips. My iphone 4s successfully restored and unlocked even though on phone lock mode. 100% is working if you try this following tips correctly. Even though I have tried all that you have said to do to try and reset my stepdaughters phone after she forgot her password and security answers it still comes back to putting in the original password which we don’t have. Her PC recognises the phone on iTunes but still will not let us reset the password without the original. Help please. Thanks Kevin!! I have a user at work that turned in their phone locked, and your article looked like the best one to try – perfect! Thanks for writing it – saved me a bunch of time! Hello folks, I believe many of you realized that many AT&T unlocking sites aren’t working anymore, it’s because AT&T doesn’t permit cheap unlocking sites’access to their database anymore. Which caused lots of third party unlocking sites incapable of unlock AT&T anymore, but you can still use ATTIPHONEUNLOCKING, it’s one of the best unlocking site for AT&T. I appreciate the article but there is a “slight” problem on my end- I don’t have iTunes on my work computer- and yes- the lovely iPhone from Craigslist is still passcode locked. Is there any other way to wipe it or should I take the phone to an Apple store? OMG!!! Thank you SO much for this info. I was unable to get into my iPhone after my spouse somehow set it up for a passcode. Luckily I had synced it to my iTunes account and was able to restore absolutely everything (nothing lost) with your instructions. You are a true lifesaver!! Mahalo, merci, gracias, vielen dank! So you can sync your phone while its disabled? And if you do this you can gain acces to your photos ? I’m not sure what you mean by disabled? If you restore your iPhone you should get access to your pictures as long as you have configured your iPhone to backup everything – either via iCloud or by connecting it to a computer and using iTunes. I have amended the above article so there are now 3 different ways you can fix this issue that should help you regardless of your circumstance. Of course if you have no backup then you can’t remove the passcode without losing all your data, including photos. Oh my god your a life saver ive been trying to get my iphone working forever now since i seen your wesite it works thanks to you. Was he able to keep everything on his phone?